April 21, 2015 (San Diego)—Scientists studying the Ventura fault north of Los Angeles have concluded the fault line is more dangerous than previously thought. Now, seismologists have concluded the Ventura fault could produce a quake measuring 8.0 on the Richter scale – along with a tsuami capable of inundating coastal areas of Southern California, affecting hundreds of miles. Update: A revised warning now includes the Pacific Northwest and Canada, as well as Hawaii. The tsunami is not expected to reach San Diego. READER’S EDITORIAL: WILL SAN ONOFRE BE OUR FUKUSHIMA? March 12, 2012 (San Diego’s East County)--A member of Vietnam Veterans for Peace, Mr. Patterson joined about 300 activists yesterday coming up from San Diego, down the coast from Eureka, and across the ocean from Japan. They converged at the San Onofre nuclear power plant for two reasons. One was to commemorate the one-year anniversary of the March 11, 2011 earthquake, tsunami and Fukushima Daiichi nuclear power plant disaster. The other was to demand the permanent shutdown of the San Onofre nuclear power plant. Read more about READER’S EDITORIAL: WILL SAN ONOFRE BE OUR FUKUSHIMA? 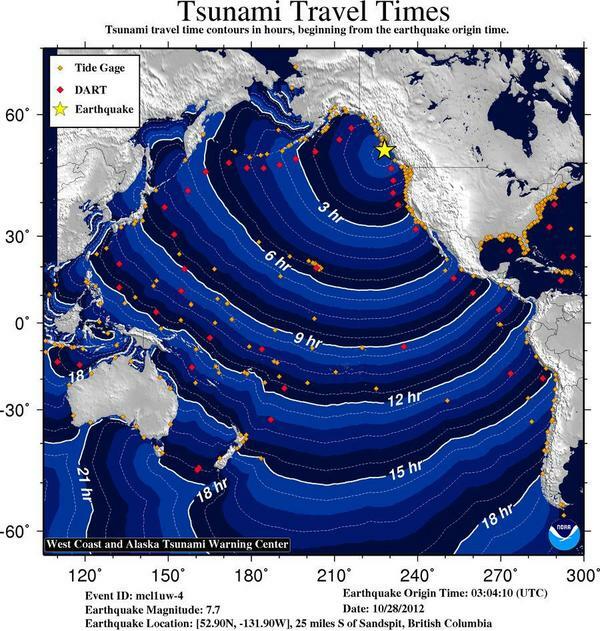 Update 3 p.m.: The tsunami effect locall remains in effect through 5:46 p.m. today for the entire west coast following an 8.8 quake in Chile. An early tidal surge proved minor in San Diego though Santa Monica had tides 2.2 feet above normal sea level. In other regions, second and third waves were higher than the first.